No hearth is complete without a fashionable fireplace tool set. 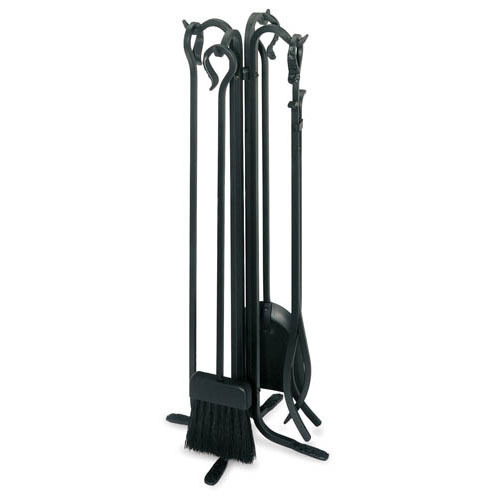 This attractive 5 piece forged hearth set is matte black and will fit nicely on most fireplace hearths. It's manufactured by Pilgrim and features a classic design, hand-forged iron construction, and an attractive matte black finish. The set includes basic tools such as a shovel, poker, broom, and tongs, as well as a stand for convenient storage. Pilgrim includes a limited lifetime warranty on this product. Can this be used (and left) outdoors? It is made from Iron and would rust over time if left outdoors. What is the weight of the 4 pc Pilgrim Tool Set? The shipping weight on this set is 16 pounds. What does a lifetime warranty cover? This warranty covers any defects in workmanship or manufacturing for the life of the tool set. Is this stable? Are the loops on the handle top large enough to put your hand in for grasping? This set allows for easy removal of the tools and has a stable base. While you may not be able to fit your hand through the loops, you can certainly gain the stability you need by grasping the loop. There were no directions although I did figure it out. The set is very nice though. Great product. Heavy and well made. Way to assemble even for me. Delivery was fast too. Couldn't be more pleased. I found this product to be very good quality and excellent value for the price. My family has fallen in love with this toolset. I had one minor issue with a piece, but the replacement process was quite easy. The construction of this product is aptly labeled heavy duty, and it looks elegant as it sits right next to our fireplace. The quality is outstanding. I made the decision to purchase this rack because it looked quite nice and promised to be easy to assemble. Thankfully, it proved accurate on every promise. The most likable feature that this tool set possesses is that nothing screws together, thereby making it impossible for anything to come apart. This was a constant annoyance with our prior toolset, and as the tools aged, it seemed like the need to keep screwing things back together increased with regularity. Best of all, this set possesses a lifetime warranty, guaranteeing that it will last for as long as needed. Best of all, the finish that this set comes in is a matte black, and it has been applied in such a way as to guarantee it will last for a very long time. This product is very well made, and best of all it possesses a lifetime warranty. The delivery process was prompt and the assembly was remarkably easy. I love how stylish and functional this product is.